Marian G. Mullet, seen here with a Pathfinder Village resident, died March 17. 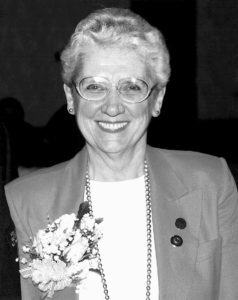 EDMESTON – Marian G. Mullet, 91, Pathfinder Village’s founding president & CEO, who worked tirelessly since the early 1960s on behalf of people with Down syndrome, died Sunday, March 17, 2019. She would have turned 92 later this week. A registered nurse by training, a fund-raiser and builder by happenstance, Mrs. Mullet is recognized as the driving force behind the early growth of Pathfinder Village, Edmeston, an internationally renowned residential campus and services provider for people with developmental disabilities. 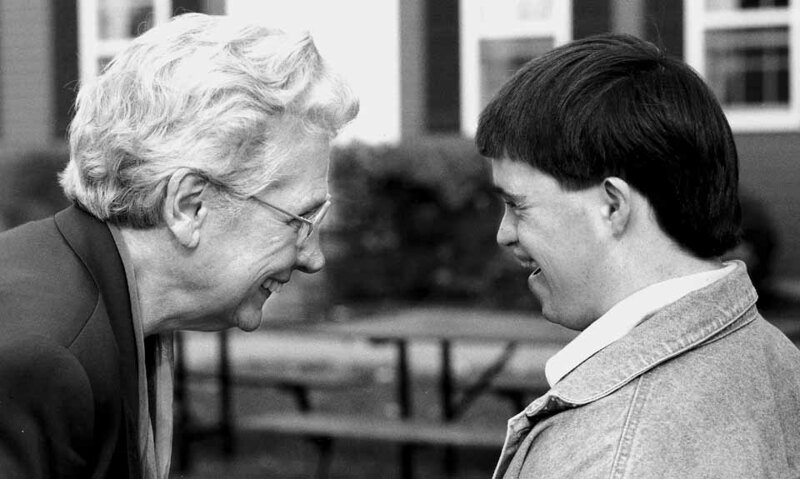 Mrs. Mullet and the Board of Directors in the late 1970s envisioned a community that would not only provide services and supports for people with Down syndrome, but also would create opportunities for personal growth, skills development, personal relationships and community inclusion. Today, Pathfinder Village is considered a global leader in human services and supports over 200 individuals through person-centered community-based programs; it has a staff of over 200, and an annual budget of $11 million. “When I first met Marian in 1982, I was unaware, though she may well have already decided, that I would be working on behalf of her beloved Pathfinder Village to this current day,” said William F. Streck of Cooperstown, president of the Pathfinder Village board and Bassett Hospital. Mrs. Mullet’s involvement with the Down syndrome community began in 1963, when her family moved to rural Edmeston from western New York; her husband, educator Frank Mullet, had accepted the job of District Superintendent at the local public school. Raising a young family as well as champion Irish Setters, Mrs. Mullet still found time to volunteer as the nursing supervisor at the Otsego School, Pathfinder’s predecessor, located in the hamlet. At that time, the school served about 40 individuals, with a majority being toddlers and children. Mrs. Mullet and other early staff leaders of the school, Norma Anderson and Janett Wiswell RN, would comfort young babies, nurture developing children, and guide teens as they attended classes and lived at the home-based school. By 1976, Mullet was a senior administrator on-staff; however, in the wake of sweeping changes in the care of persons with developmental disabilities put into motion after the Willowbrook Consent Decree, the Otsego School faced closure by state officials. Understanding that their old school buildings would not pass stricter life-safety codes, the school’s parents formed a new Board of Directors, raised funds, and tapped Marian Mullet as the new school’s director. “I think the Board took a terrible chance with me,” Mrs. Mullet admitted in remembering the transition in a 1999 interview with Bates College Magazine. “We formed a whole new organization out of a cornfield.” Following four years of intense planning, fund raising, and construction, Pathfinder Village, then consisting of seven homes and a school, opened on July 29, 1980. In that same interview, Mrs. Mullet spoke on the progress she’d witnessed during her career, going from the routine institutionalization of people with developmental disabilities to the inclusion of individuals in the community and creating enriching residential and habilitation settings. As Pathfinder Village was being built at the site of a 23-acre cornfield near Edmeston, the Mullet family faced their own personal tragedy, their youngest son’s diagnosis and battle with cancer. Thomas Frank Mullet, a student at Colgate University, died in 1980. Later, Mrs. Mullet reflected that she found great comfort in the birch trees that were planted in Pathfinder’s front yard in Tom’s memory, as they provided her with a sense of closure. Following the opening of the Village, Mrs. Mullet’s drive and vision continued: She, Board members and parents raised funds to develop a thriving integrated community with 10 colonial style homes, a bakery and café, a non-denominational chapel, recreation spaces, a central kitchen and dining facility, and other projects, amounting to over a $10 million investment. The crowning achievement of her career at Pathfinder Village occurred on October 6, 1996, with the opening of the Kennedy Willis Center on Down Syndrome, established as the organization’s outreach, hands-on education, life planning and research arm. Since 1996, the Center has handled queries from a global audience, and has held over 50 workshops, seminars and conferences on topics related to Down syndrome and other developmental disabilities. Mrs. Mullet officially stepped down as the Village’s President & Chief Executive Officer following a formal recognition dinner for her achievements, held at The Otesaga, Cooperstown, in 2001. Following her retirement, Mrs. Mullet worked for several years with her daughter, Martha Winsor, and her granddaughter, Deborah Winsor Batt, to write and richly illustrate a comprehensive biography on her maternal uncle, Richard Andrew of Boston, a renowned painter who was celebrated for his deeply sensitive portraits and moving landscapes. Andrew’s most recognized mural honors the 104th Massachusetts Infantry and is in the Hall of Valor in the Massachusetts State House in Boston. The book “Richard Andrew – Called to Paint,” published in 2010, has received acclaim from American art scholars and historians. Along with being an author, nurse, advocate and businesswoman, Mrs. Mullet was awarded honorary doctorates of Law from Bates College (1988) and of Humane Letters from SUNY Oneonta (2002). 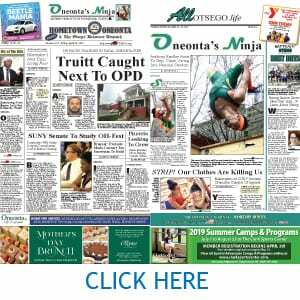 She was named as a “Woman of Distinction” by the state Senate in 2000 upon the 20th anniversary of Pathfinder Village, and served on the boards of The Scriven Foundation and The College Foundation of Oneonta. The second of five children, Marian Goddard Mullet was born on March 23, 1927, to Dr. Harvey B. and Marguerite Andrew Goddard in Hartford, Conn. A 1945 graduate of East Hartford High School, she went on to graduate with the last nursing school class of Bates College in 1950. She began her nursing career at the New England Baptist Hospital, Boston, and married Frank Mullet of Worcester in 1950; they met during their time at Bates College; her father and siblings also graduated from Bates. Along with many friends, professional colleagues and admirers, Mrs. Mullet is survived by her husband of 68 years; a daughter and son-in-law, Martha Mullet Winsor and Martin Winsor of Edmeston; two sons and daughters-in-law, Dr. James G. and Pamela B. Mullet of Roanoke, Va., and Dr. John and Debra J. Mullet of College Station, Texas; seven grandchildren, Deborah W. Batt (Daniel), Elizabeth W. MacKenzie (Sean), Sarah W. Hartman (Christian); Hillary Mullet, Benjamin Mullet (Julia), Adam Mullet, Ian Mullet (Shea Walterscheid), and seven great-grandchildren. She is also survived by her younger siblings, Elizabeth G. Calabrese of Homestead, Fla., and Stephen B. Goddard of New Haven, Conn., and numerous nieces and nephews. Mrs. Mullet was predeceased by her brothers Harvey, Ralph, and Arthur Goddard, and son, Thomas Frank Mullet. A celebration of Mrs. Mullet’s life will be held for family, friends, and the public at the Pathfinder Village Gymnasium, formally known as the Marian G. Mullet Sports & Recreation Center, on Sunday, April 7, 2019, beginning with calling hours at 11 a.m. followed by a service at 1 p.m. In lieu of flowers, Mrs. Mullet’s family requests that donations be made to The Thomas Frank Mullet Scholarship at Pathfinder Village, 3 Chenango Road, Edmeston, NY 13335, or to The Thomas Frank Mullet Foundation, 36 South Street, Edmeston, NY, 13335, which provides annual awards that benefit people and organizations in the Edmeston area.